If you are completely new to the idea of layers, one way of familiarising yourself is to add text to an image.A fun project is making personalised greetings cards. Open a suitable photo having done any cloning and adjustments. You can make adjustments after adding text layers but for the purpose of this exercise it’s more straightforward if you have a good image to start with. And it’s a good idea to work on a copy of the image so if it all goes horribly wrong, you’ve got the original. Crop the image to roughly the desired size – say A5 (21 cm by 14.8 cm) at 300 ppi. Do this by clicking on the crop icon and entering the dimensions in the width and height boxes, with the units (eg 21 cm or 8 in)and the resolution in the resolution box.  Make sure the Layers Palette is open. If not, go to Window on the top toolbar and tick Layers.  Make sure ‘auto select’ is ticked by clicking on the Move Tool then on the auto select box on the top tool bar. This ensures that when a layer on the image is selected, it automatically highlights the layer in the Layers Palette.  Select the Horizontal Type Tool (T). For vertical type, right click the Type Tool and select Vertical Type.  Select colour of text. Click on the Text Colour box on the top toolbar. This opens the Colour Palette. Select a colour. Clicking on the foreground colour box (the black and white boxes in the tools palette on the left hand side) does the same thing.  It can be effective to match the text colour to a colour contained in the photo. I picked out the pink in Lois’s headband by using the Eyedropper Tool and clicking on the part of the headband containing the colour I wanted. Doing this changes the foreground colour box to the desired colour. Select the Text Tool again and the Text Colour box at the top of the screen becomes the chosen colour.  Choose a font from the drop down menu in the font box at the top of the screen, and the font size.  You are now ready to start typing!  With the Type Tool (T) selected (the cursor will have changed to something that looks like an open book) position the cursor on the image and type your message.  You’ll see that a layer is automatically added to the Layers Palette and will be called Layer 1. 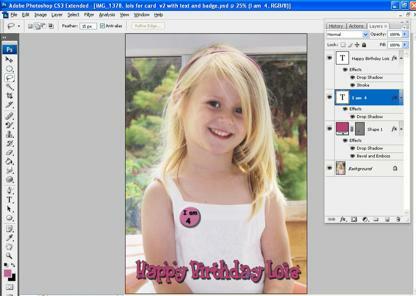 To commit the text, click on ‘Layer 1’ and the name of the layer will be whatever you typed (eg Happy Birthday). The name of the layer can be changed by double clicking on it and typing in a new name.  You’ll probably find you want to change the font or text size. Activate the edit function by DOUBLE clicking on the T in the white box in the Layers Palette. This highlights the text on the image. Click on the text and edit. Commit the changes by SINGLE clicking on the T in the white box. To add more text to that layer, activate the edit function and type. However, if you want to add new text, independent of that layer (eg ‘I am 4’) repeat the ‘Adding text’ instructions above.  Select the Move Tool and move the text (making sure ‘auto select’ is ticked).  Make the text more interesting by adding an effect. If you are using a paler colour, as in this case, a darker outline helps it stand out. Go Layer (on top toolbar) > Layer Style > Stroke. Select the colour, line thickness etc.  To add a shadow to text go Layer > Layer Style > Drop Shadow (or Inner Shadow) and select the colour, size, spread etc. Match the angle of the shadow to that of any shadows in the photograph.  Experiment with other effects in the Layer Style palette such as Glow and Emboss.  In the example here I added a circle for the badge by right clicking on the Rectangle Tool (on left side tool bar) > Ellipse Tool and drawing a circle. A bevel and emboss effect was added to make it look 3D.  To add speech bubbles go Rectangle Tool > Custom Shape Tool > and select a shape of speech bubble from the top toolbar.  Select a colour for the shape/bubble from the colour box on the top tool bar. There are also some pre-set styles in the Style option on the top toolbar.  Drag and drop the unwanted layer to the trash can at the bottom of the Layers Palette or right click on the layer name in the Layers Palette and select Delete.  Select the layer you want to hide and click on the Eye icon for that layer in the Layers Palette. The layer will not appear on the image. Click the icon again to turn it back on.  Layers are like stacked sheets – a higher one covers over the one underneath. With the badge and its text, for example, the ‘I am 4’ layer must be above the shape layer in the Layers Palette. If it was below, it would be hidden underneath the badge on the image. To change the layer order, select the layer in the Layers Palette and drag and drop it to the required level.  Save the image as a PSD file, This preserves the layers so you can go back and edit it.  Flatten the image for printing etc. Go Layer > Flatten. Save as a JPG or TIFF.